£65 UK ONLY orders; includes Special Delivery. REST OF WORLD orders: please email: birdart@ericpeake.co.uk for payment details and shipping costs. 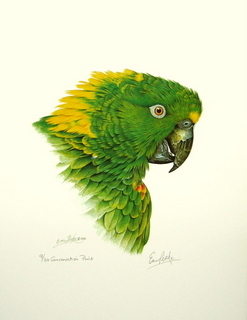 Artist Signed & Numbered Limited Edition Print of a Double Yellow-headed Amazon. CONSERVATION PRINT. 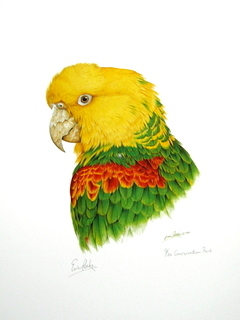 Artist Signed & Numbered Limited Edition Print of a Yellow-naped Amazon. CONSERVATION PRINT. 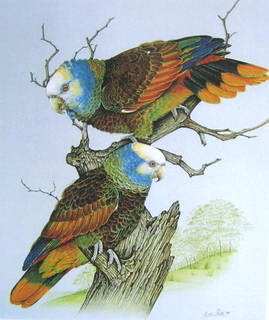 Moluccan Cockatoos. PUBLISHER EDITION. RARE. £200 UK ONLY orders; includes Special Delivery p/p. Artist Signed & Numbered Limited Edition Print of Hyacinthine Macaws. No: 10 of 10 PUBLISHER EDITION. RARE. ALL EDITIONS SOLD OUT. LAST ONE. £65 UK ONLY orders; includes p/p. NOW AVAILABLE: Artist Signed & Numbered Limited Editon Print of Yellow winged Amazons. ONLY 3 available, all low number regular Edition SECONDARY MARKET. £100 UK ONLY orders; includes Special Delivery p/p. Artist Signed and Numbered Limited Edition Prints of Yellow Winged Amazons. CONSERVATION PRINT. £125 UK ONLY orders; includes Special Delivery p/p. No 4 of 10 ARTIST EDITION Artist Signed & Numbered Limited Edition Print of a Palm Cockatoo. ARTIST EDITION. RARE. SOLD OUT. No longer available.SOLD OUT. No longer available. Artist Signed and No. 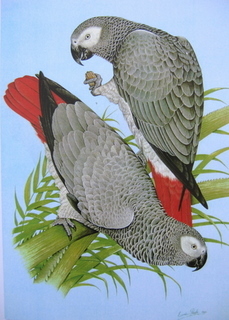 Limited Edition Publisher Print of African Grey Parrots. NOW SOLD OUT. £150 UK ONLY orders; includes Special Delivery p/p. Artist Signed & Numbered Limited Edition Print of Major Mitchell's. ARTIST EDITION. VERY RARE. Artist Signed & Numbered Limited Edition Print of Eclectus Parrots. ARTIST EDITION. £50 UK ONLY orders; includes p/p. 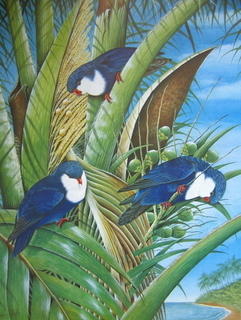 Artist Signed & Numbered Limited Edition of Tahitian Blue Lories. SECONDARY MARKET REGULAR EDITION. Artist Signed & Numbered Limited Edition Print of a Blue and Gold Macaw. CONSERVATION PRINT. £100.00 UK ONLY orders; includes p/p. Limited Edition print on SECONDARY MARKET, Regular Edition, signed and numbered. Just became available. RARE. £45 UK orders ONLY; includes p/p. 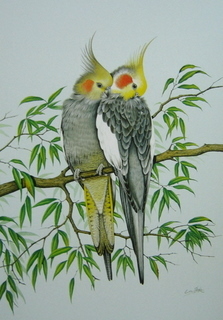 NOW AVAILABLE Limited Edition signed and numbered print of Normal Cockatiels. Secondary Market. Rare. 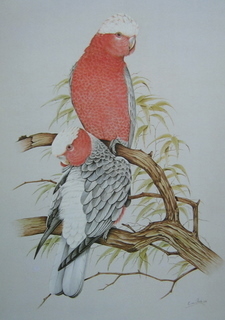 Artist Edition (rare) limited edition print of Rose breasted Cockatoos. From the artist's private collection. Regular Edition of Rose breasted Cockatoos limited edition print. SECONDAREY MARKET: just became available. 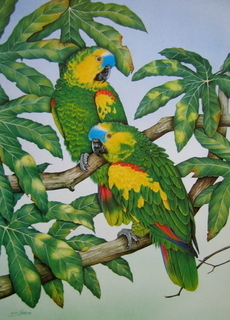 Artist Signed and No 1 of 6 Artist Edition of African Grey Parrots. INVESTMENT POTENTIAL. LAST ONE. Palm Cockatoos Head Study ARTIST EDITION No 10 of 10. RARE. INVESTMENT POTENTIAL. Palm Cockatoo Head Study Artist Edition No 1 of 10 Artist Signed and Numbered Limited Edition. RARE. INVESTMENT POTENTIAL. Artist Edition No 1 of 6 Artist Signed and Numbered of St Vincent Amazons. ALL OTHER EDITIONS SOLD OUT. LAST ONE. RARE. INVESTMENT. 200.00 GBP UK only orders including special delivery shipping. REST OF WORLD: please email: birdart@ericpeake.co.uk for payment and shipping details. Publisher Edition No 10 of 10 Artist Signed and Numbered Limited Edition of Moluccan Cockatoos. RARE. INVESTMENT. Artist Edition No 1 of 10 Artist Signed and Numbered Limited Edition of Hyacinthine Macaws from the artist's private collection. RARE. INVESTMENT. Artist Edition no 1 of 10 Artist Signed and Numbered Limited Edition of Hyacinth Macaw Head Study. LAST ONE. INVESTMENT POTENTIAL. VERY RARE. 100.00 GBP UK only orders including special delivery shipping. Portrait in Pink, Major Mitchell Cockatoo Portrait Artist Proof No 7, Artist Signed & Numbered Limited Edition Print. 150.00 GBP UK only orders including special delivery shipping. 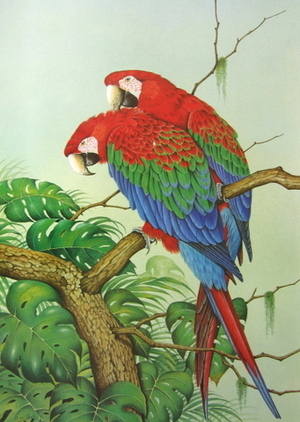 Jewel of the Rainforest, Greenwing Macaws Conservation Print, Artist Signed and Numbered Limited Edition Print. Certificate of Authencity.